Capcom wants to make another Darkstalkers title, but it needs fans to put a few hundred thousand more requests. 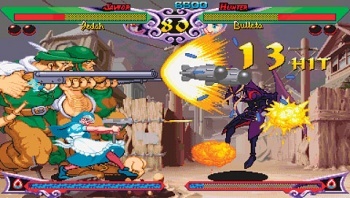 Capcom's Darkstalkers came out at the height of the 2D fighting game craze of the mid-1990s, but a brand new title in the series hasn't been seen in a decade (despite a recent PSP port of a previous game). With the reinvigoration of the fighting genre in recent times thanks to Street Fighter IV and Tekken, Capcom producer Yoshinori Ono has a "dream" to bring back Darkstalkers as well, but it's going to take around one million requests from fans. Speaking to Eurogamer about the upcoming Street Fighter x Tekken, Ono said that if the Namco/Capcom crossover can do well, the sky's the limit for future fighting titles. However, he said: "If this doesn't do well, then my ultimate dream, Darkstalkers, will also flop." Darkstalkers's cast of characters, which features fictional monsters like werewolves, mummies, zombies, and Little Red Riding Hood, makes it more lovable than other fighting franchises. It's not totally dead though, as characters such as Morrigan and Felicia fortunately still live on through multiple Capcom crossover titles like Marvel vs. Capcom 2 and the upcoming Marvel vs. Capcom 3. Ono says that before Capcom will say yes to a new Darkstalkers, it'll have to get "one million" requests. Unfortunately, only 5000 have been received, he reveals. To see a new ultimate monster battling game fans will need to "make noise," according to Ono. He says: "Anything about Darkstalkers - they can write about it, or whenever there is a random blog ranking of what you want the most - if we see Darkstalkers that would help." He's not kidding either, as Ono adds that the reason Street Fighter IV was made was thanks to fans making noise about wanting a Street Fighter revival. If a new Darkstalkers does come out of Capcom, it's unfortunately still going to take a while. Street Fighter X Tekken isn't expected for years, and Darkstalkers reportedly wouldn't come out until the crossover is finished and available on shelves.